No, we at Kaizen Factor were not blessed with this immense privilege. Rather, consider it a huge perk of being a Japan-based journalist such as Bertel Schmitt, Editor-in-Chief of The Truth About Cars. A response to Lexus LFA chief engineer Haruhiko Tanahashi’s (shown at left, as photographed by Schmitt) “reckless” invitation over 6 months ago, this in-depth tour of the Motomachi LFA Works in Toyota City is a must-read (and must-see) for diehard fans of Japan’s ultimate automotive achievement. Cleverly teased in early July in a Where in the World Is Carmen Sandiego?esque contest – complete with iPad giveaway – the tour itself is written in 5 separate chapters, accessible by clicking on the bolded chapter titles below. Following is our brief commentary on each chapter, but we strongly suggest clicking on the links and reading, seeing and experiencing the LFA manufacturing process as seen through the eyes, ears and lens of Bertel Schmitt. Born of a casual conversation in a Hokkaido bar between Tanahashi-san and Tetsuo Hattori, at the time his boss and the top vehicle engineer at TMC, the painstakingly-kept “LFA Diary” records 10 February 2000 as the initial approval of a study for “a real sports car”. Also told here is the story of numerous harrowing reprieves from the ruthless axe of the controller bean counters and, in 2005, the pivotal decision to go with carbon-fiber construction – produced in-house, no less – in order to save a further 100 kg (220 lbs) of curb weight. This is probably the meatiest of the chapters, covering Carbon Fiber 101 (the three different ways of making Carbon Fiber Reinforced Polymer, or CFRP), the making and baking of the Lexus LFA’s dashboard, A-pillar/roof support and front bumper crash box and the two-of-a-kind circular loom more properly known as the three-dimensional braider. As to the location of the second circular loom, it is seemingly in the textile engineering department of Philadelphia University. A broad-based, multi-faceted chapter that is, perhaps, this author’s favorite, this covers everything from the titanium muffler that costs the same as a new Toyota Corolla to body construction that is neither monocoque nor quite space-frame to a discussion of paint colors to meeting Shigeru Yamanaka, the “conductor” of the 170-piece passionate “orchestra” that assembles the LFA, all bookended by a discussion of the unremarkable origins of the LFA name itself. And, while having gently chided us for perhaps going overboard in the search for LFA meaning and symbolism, Schmitt himself can’t resist and, similarly, notes the coincidence between the LFA’s original 680 model code and the DAU 0680 license plate on the Tiffany Blue LFA tester recently spotted at the Nürburgring. 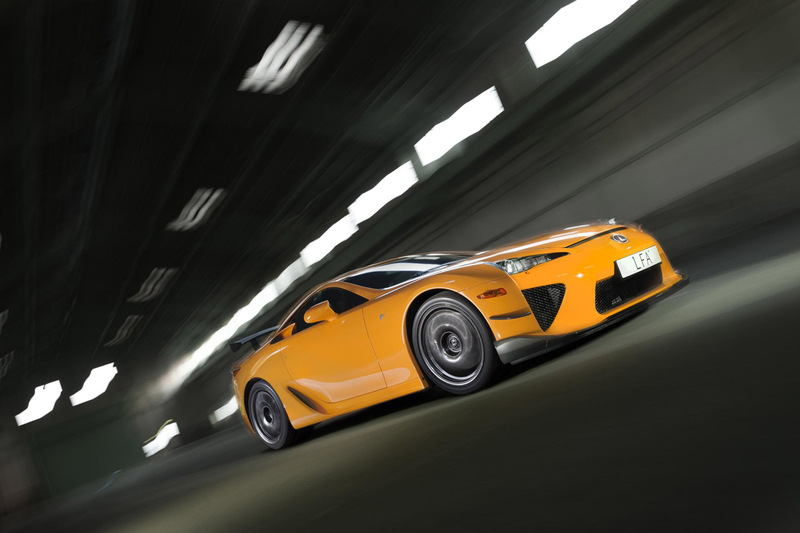 Here, the focus is on the Lexus LFA’s 1LR-GUE 4.8-liter V10. Back in November 2009, yours truly reported that “it is physically smaller and lighter than the 2GR-FSE 3.5-liter V6 that powers the Lexus IS 350” without having been able to coax an actual figure out of Lexus USA officials, and, over 2½ years later, some things don’t change, it seems. Also noted in this chapter is Lexus’ painstaking recordkeeping of “evidence sheets” of each and every LFA built (also touched upon in earlier chapters) and details on a couple of minor underhood differences between “regular” and Nürburgring Edition LFAs. Does the mysterious baby blue Lexus LFA AD-A have a royal connection? As far as this author is concerned, the news broke a couple of days ago via our own Twitter feed which, in turn, picked it up from the Gmotors.co.uk site. The news in question? 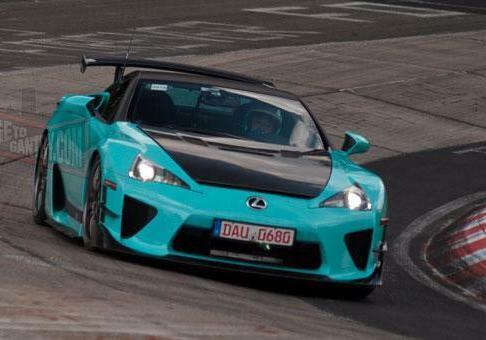 The sighting of a “special Tiffany Blue colored LFA spotted testing at (the) Nürburgring!” At first seeming to be nothing more than an LFA Nürburgring Edition in an odd exterior color, the blogosphere soon jumped on a number of differences, most of which were subtle enough: an extra horizontal vent on the hood, exposed black carbon fiber on the hood and roof, larger front lip spoiler, front winglets, side rocker sills and taller rear fixed wing spoiler. Those subtleties pale, however, compared with what you see above: a significantly reworked rear fascia that trades other LFAs’ signature centrally-mounted triple exhaust for quad pipes stuck two in each rear radiator opening. This, in turn, leads to cascading dominos of further alterations, in essence pushing the rear radiators down and half-hidden by the rear bumper, and an entirely redesigned rear diffuser. Hmmm… is all this hiding more power and showing cleaned-up aerodynamics? As the story spread, most pundits suggested that, with only 9 or 10 LFAs remaining unsold, we may, in fact, be looking at a Final Edition or the stillborn Tokyo Edition or LFA II. Beyond the obvious, two questions gnawed at this particularly detail-oriented author: What lurked behind the pixellated license plates? 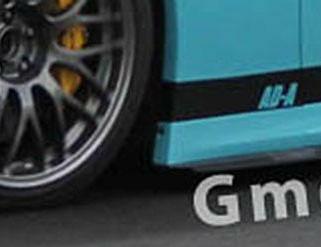 And what do those AD-A initials on the Lamborghini Superleggera-inspired side stripes stand for? The license plate itself merely indicates that the car is registered in the municipality of Daun, in the state of Rhineland-Palatinate (or Rheinland-Pfalz in German). The red numbers on a white background, and the fact that the number starts with 06, denote that this Lexus bears dealer plates commonly used for unregistered cars going on test drives. 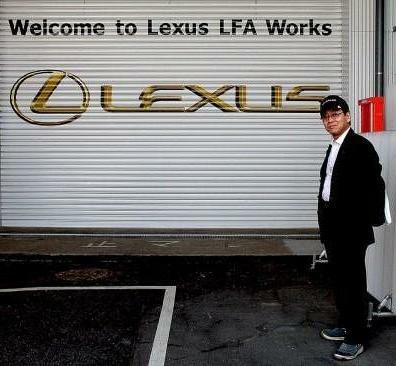 Almost 2½ years later, on October 2010, another my.IS story by yours truly noted the existence of additional Lexus GS and IS-based test mules with DAU 0679 and DAU 0684 plates. And what is the relevance of all this? If the hidden plates bear one of these numbers or thereabouts, it makes it that much likelier that this is an official Lexus test, as opposed to a private owner or tuner project. Fortunately, the ever-informative Bridge To Gantry Nürburgring fan site quickly enough provided an answer via unpixellated photos (such as the one at right) clearly showing a DAU 0680 license plate. This certainly seems to fit into the broad DAU 0679 / 0683 / 0684 sequence used by previous Lexus testers. Tiffany Blue or Al Thani Blue? Sit tight and make sure your 5-point harness is properly fastened, for this story has more unexpected twists and turns than a hot lap of “The Green Hell”. Hence, we’re going off on an…er…colorful tangent before we even address the second question we raised earlier. That “Tiffany Blue” that Kaizen Factor co-editor Flipside909 referred to in our Twitter feed? It’s not a Lexus LFA shade, but the colloquial name for the light medium robin egg blue color associated with Tiffany & Co., the New York City jeweler. A visit to the ToyotaReference.com Lexus LFA page suggests that either Aqua (paint code 9K0) or Sky Blue (paint code 9J5) is the paint that graces the LFA AD-A. This may well be, but, in post-story commentary for The Lexus Enthusiast‘s initial LFA AD-A story, ForumJapAuto simply and rhethorically asked, “LFA for Al Thani?” and provided a Google images link to a bunch of high-end supercars painted in a similar if not identical shade of robin’s-egg blue. Curiosity piqued, this author learned that “Al Thani” refers to the ruling family of the ultra-wealthy Arab kingdom of Qatar. The emirate’s current ruler is Wiz Khalifa Hamad bin Khalifa Al Thani. Some of the family’s blue supercars were the subject of a late 2010 YouTube video, while a Koenigsegg CCXR and Lamborghini Murcielago LP670-4 SuperVeloce owned by the clan were famously clamped for improperly parking outside the Al Thani-owned Harrods department store in the swank Knightsbridge area of central London. Thus, we may simply be seeing the Al-Thani family’s newest ride, a Nürburgring Edition LFA taking advantage of one of its “free” track sessions. If so, with all those unusual touches, this may well qualify as the most expensive LFA of the lot. Or, perhaps, it’s some sort of Lexus test mule whose color scheme pays homage to the unique tastes of the Qatari clan. So, what does AD-A stand for? A Google search does not provide any sort of answers, but we do offer up a trio of possibilities. One, suggested by my esteemed colleague Flipside909 on a Club Lexus thread is that it stands for Advance Development – Apex, the latter being what the “A” in LFA stands for. ADAC stands for Allgemeiner Deutscher Automobil-Club. The organization is Germany’s and Europe’s largest automobile club, their equivalent of the American Automobile Association (AAA) in the U.S. Unlike their American counterparts, however, the ADAC are members of the FIA (Fédération Internationale de l’Automobile), the governing body for motor racing events such as Formula 1 racing; and of the DMSB (Deutscher Motor Sport Bund), which is Germany’s motor racing governing body. The European Grand Prix, the former ADAC Eifelrennen, the 24 Hours Nürburgring and many other races are hosted by ADAC. All the cars belong to a few persons “ANA Al-Thani”, which stands for “Abdulrahman, Nasser, Abdulla”. Probably three brothers or cousins. Leaving aside the fact that, per Wikipedia, Abdulrahman died in 1930, perhaps this LFA is owned by a different combination of Al-Thani family members whose initials are ADA. …and sets a new Nürburgring record! Barely a couple of days after Toyota’s breaking the electric vehicle lap record by over a minute came word that the carmaker’s non plus ultra Lexus LFA Nürburgring Package set a record of its own on its namesake circuit’s Nordschleife configuration. The news broke, in very 21st-century fashion, via a post on Chris Harris of evo magazine’s Twitter feed on Friday 2 September, later retweeted (and, thus, tacitly confirmed) by Lexus Europe Public Relations. This was swiftly picked up by The Lexus Enthusiast, where comments by Maarten and 05RollaXRS led us back to a thread on the Club Lexus LFA forum informing us of a 31 August and 1 September 2011 LFA Nürburgring Edition experience in Nordschleife event for a few current and future LFA customers from around the world. Club Lexus member (and LFA owner) Gengar described it as “a track acclimation program on the Nordschleife in the Nürburgring Edition, a hot lap with a professional driver, and a brief public road test. Additionally, on the first night of the program, owners will be invited to attend a product and technical exhibition on the Nürburgring Edition as well as…dinner with Lexus LFA staff” (including, it turned out, LFA Chief Engineer Haruhiko Tanahashi). It was amidst these demonstrations that, in an almost impromptu fashion, the new record was set. Well…maybe not. As an official European Lexus Media Site news release informs us, on Wednesday 31 August 2011, Lexus undertook a performance check (love the understatement) with the Lexus LFA Nürburgring Package at the Nürburgring Nordschliefe (North Loop) in Rhineland-Pfalz, Germany and recorded a lap time of just 7 minutes 14.64 seconds. The tires used during the performance evaluation were Bridgestone Potenza RE070 tires which are the standard road legal specification for this LFA. As Bertel Schmitt of The Truth About Cars reminds us, the LFA ran the full 20.6 kilometer “sport auto” lap common for manufacturer record runs, and not the shorter, tourist-oriented 19.1 kilometer “Bridge to Gantry” lap. Speaking of which, Bridge to Gantry.com adds that the iPool laptime method (from the end of the T13 straight to the start of it) is pretty much the industry standard as it’s a simpler solution for the guys who are using T13 pitlane on the industry pool days. 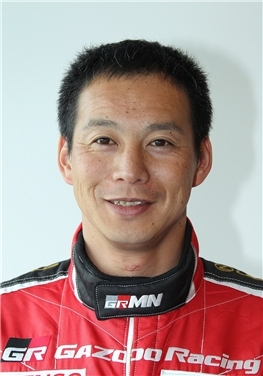 Behind the wheel of the LFA for the record-making run is 42-year-old Akira Iida, a Japanese race car driver who entered Super GT racing in 1994, just after the series got its start. After two years running the #10 Nissan Skyline for the Johnson team in the GT-1 class, the rules overhaul that led to the formation of GT300 and GT500 classes (named for their horsepower limits) coincided with Iida’s move to the latter class and the Raybrig team’s #100 Honda NSX, in which he competed until the end of the 2001 season. He really hit his stride, however, with his 2002 move to the ESSO Ultraflow team’s #6 Toyota Supra, becoming the series champion in his maiden season with the team. In 2003, he moved to the team’s #1 Supra, and finished second overall for the season. The following year, he returned to the #6 Supra, finishing third overall. 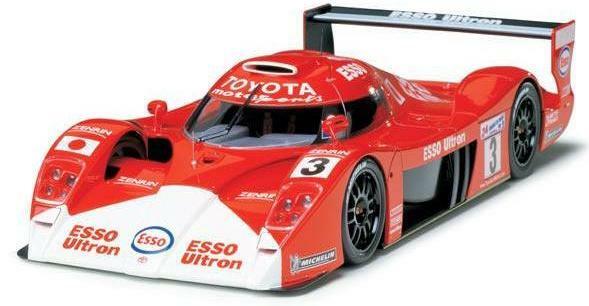 After completing four seasons with the ESSO Ultrafow Supras in 2005, the team, now rechristened Mobil 1, changed over to the Lexus SC 430 for Iida’s final GT500 season in 2006. This hardly meant the end of Iida-san’s racing career, however. Earlier having dabbled in Formula Nippon (Japan’s take on Formula 2 and Formula 3000 racing) and, most crucially, endurance racing (including a victory in the GT2 class co-driving a Honda NSX in the 1995 24 Hours of Le Mans), he then joined Toyota’s elite team of test drivers that competed in the Lexus LFA in the 24 Hours of the Nürburgring. In fact Iida-san became the team’s lead driver, as he co-drove the Japanese V10 supercar all four years (2008 thru 2011) in which it has raced in the German round-the-clock event. 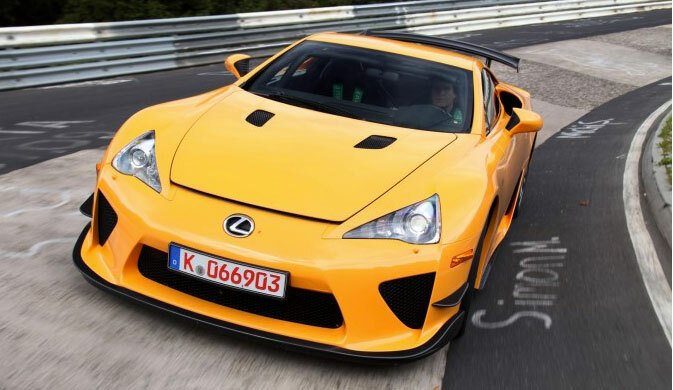 So, which cars remain faster than the Lexus LFA ’round the ‘ring? Dale of the ever-informative Nürburgring fan site Bridge to Gantry started, back in March, a frequently-updated Fastest Production Car Lap of the Nurburgring chart. Beyond simply posting numbers, Dale informs us whether or not video exists and, more importantly, whether or not the vehicles truly meet production criteria. The current record-holder, the Pagani Zonda-R with a time of 6 minutes 47.5 seconds, gets a no because “it’s seriously awesome, but it’s not a road car. Crap, it’s not even legal for GT racing!” Next is the Radical SR8LM (the basis for the electric Toyota TMG EV P001 we recently wrote about). 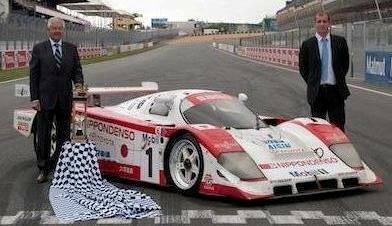 Powered by a 2800 cc RPE RPA V8, it lapped the ‘ring in 6 minutes 48 seconds. Dale gives it a maybe in validity, as it’s “road-legal in Britain and a LOT of other countries, but not everywhere – notably the USA”. The third and final car to tuck in under the 7 minute mark is the Ferrari 599XX. This is a track-only, non-street legal version of the Ferrari 599 GTB Fiorano that was soundly beaten by the Lexus LFA in an evo magazine comparison test. Besides the lack of street legality, the 599XX also ranks as a no because Ferrari “cheated” and ran it on racing slicks, as opposed to street-legal tires. The fourth and final car to lap the Nürburgring faster than the LFA is the Gumpert Apollo, with a time of 7 minutes 11.5 seconds. This Audi-engined, built-to-order supercar ranks a maybe, since it’s “not strictly type-approved…but it is road-legal in Germany.” Porsche 911 GT2 RS? Chevrolet Corvette ZR1 or ZO6? Nissan GT-R? Maserati MC12? Pagani Zonda F? Ferrari Enzo? Porsche Carrera GT? Fuhggedaboutit! 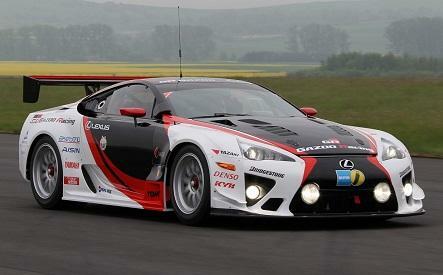 The Lexus LFA trounced them all! That’s right, if you want an ultra rare piece of historical machinery, this is your chance. With only 351 produced for the world and 84 produced as left hand drive models, only 62 of those cars came United States. Like the limited production Lexus LFA (500 worldwide, approx 171 USA), the Toyota 2000GT have a lot in common. Both cars are 2 door, 2 seater, front engine rear wheel drive, grand touring cars co-developed by Toyota and Yamaha. 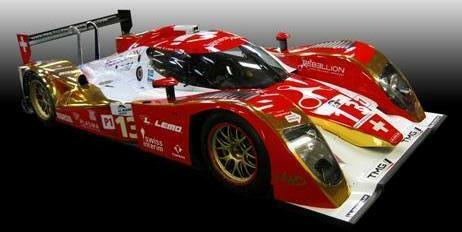 Want to own the ultimate Toyota/Lexus collection? Custom order your 2012 Lexus LFA to match the 2000GT’s White exterior with Black leather interior, then hit “BUY IT NOW” for a cool $650,000. Be the envy of Toyota enthusiasts worldwide and pick up 2000GT #88!